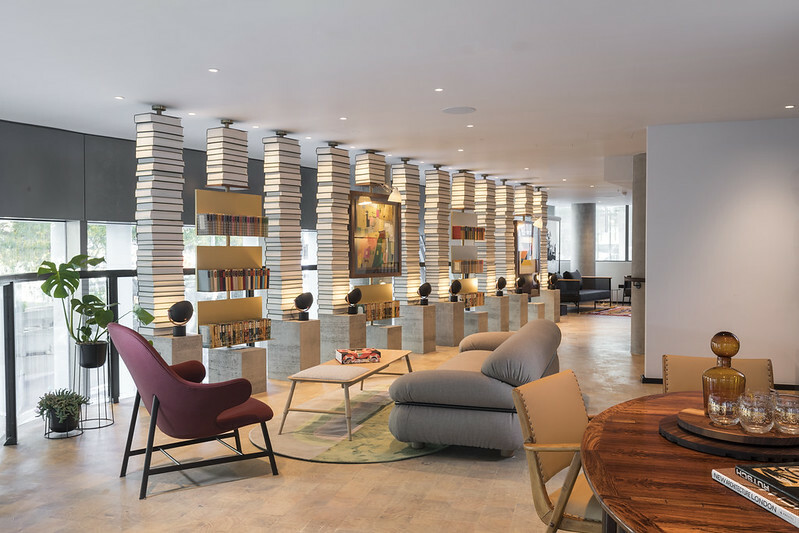 The Bankside Autograph is a new build hotel on the south side of the Thames just next to Blackfriars Bridge and close to the Sea Containers (formerly the Mondrian) hotel. It opened in October last year. It is part of a development whose most striking building is a very tall, 50-storey, 170-metre high, apartment block – One Blackfriars, where apartments range from just under £5 million to £15 million. Autograph Collection Hotels is part of Marriott International and, so far, there are around 150 hotels in over 30 countries. The hotel has gone big on design and art, under interior designer Dayna Lee, who has partnered with Contemporary Collective and filled the hotel with modern art, recycled pieces (table tops made from recycled plastic, for instance) and even an artist in residence producing works of art inspired by the South Bank area. Walk through to the lifts and you’ll see portraits by Helen Gørill on the right, commissioned by Bankside of three iconic people – Sir Christopher Wren, the Mona Lisa and Shakespeare with a skateboard (there is a skate park nearby). The public areas also have pieces by Galvin Brothers Handcrafted Furniture, with a custom stone walnut table and dining tables in the restaurant. The reception desk is low and you are invited to sit down to check in, which always feels a little strange to me. I always want to stand and get on with it as quickly as possible, so I stood while they sat. It was quickly done and I didn’t take up the offer of being conducted to my room. The lifts are to the left along the corridor. On each floor there is a vending machine, which replaces the mini bar in the room. The machines contain everything from small bottles of good (but expensive) wine through to an Adult pack – no idea what this contains. Bear in mind that there are fridges in the rooms (containing glass bottles of water and some fresh milk for tea and coffee), but you’ll find a Waitrose next door, so it’s worth stocking up from there and keeping your drinks in the fridge – especially if you’re staying for a long period. On each corridor, there is also a fresh water dispenser, if you run out of bottled water, or don’t fancy drinking London water (there’s nothing wrong with it). These and other measures are part of the hotel’s eco credentials, of which more later. On the south side of Blackfriars Bridge, right opposite the Thameslink station (the Bedford to Brighton line) and a short walk from Southwark Underground station, which is on the Jubilee Line. The 161 rooms are on five floors, accessed by corridors with Cy Twombly inspired corridor prints. The ceilings are in polished concrete (part of that art studio vibe the designer was aiming for) and there is a large architectural image of a tower block on the Great Arthur Estate in EC1, with manipulation adding funny images in the windows. There are also some expensive looking desk lamps, and a good globe lamp in the bathrooms, and I liked the wooden floor with the faded colourful rugs. More importantly, there are a huge amount of plugs around the room as well as USB charging by the beds (12 plugs and USBs apparently), and the wifi, which is extremely fast, was complimentary. Lights were easy to turn off from the bed, though I found I had to go round turning them all back on individually in the morning – probably I did something wrong. The flat screen TV is large and also has Google Chromecast. Weirdly, this didn’t work with my Google phone (Pixel 3), but a helpful guy from the hotel came up and showed it worked with every other form of device, including my own laptop. I contacted Quadriga Europe through its Twitter account to see if it had had other users encountering this problem and to notify them. The team there is available from 0700-1600. I’m still waiting to hear back. As already mentioned, there is a Nespresso machine which also makes tea (well, produces hot water), some Joe’s Tea Co tea bags and fresh milk for both tea and coffee. If you buy one, please give me 10 per cent commission. The hotel has a mezzanine floor where there are plans for a small bar, but it’s on the ground floor that you’ll find the main restaurant and also the main bar. This is called Art Yard, and as you’d expect it has lots of art both on the walls and as standalone sculptures, but it’s an attractive place, and works well both as a bar and a restaurant. I’ve been to functions here (both downstairs in the meeting rooms and upstairs), and now having seen it on a normal night, it’s impressive how it all works. The walls of the restaurant have hand-painted tiles by Laura Carlin, or, as I ought to put it “two wall murals composed of illustrated tiles that bring to life the cultural narratives of the South Bank”. In addition, Malgorzata Bany, a London-based artist and designer, has created a series of tables, although I didn’t identify which ones these were. The meal in the evening had a short but delicious menu (you can see an example of it here from the website). I had a small pizza of buffalo ricotta, artichokes and tomatoes, and then a main course of sea bass with cavolo nero pesto and horseradish (£16.50) with side orders of roasted sweet potatoes, with harissa and pomegranate molasses and also carrot with tahini and linseeds. Delicious and filling, just right for a freezing cold January night. The lower floor is where the various meeting spaces are, including whitebox which is like an art gallery, but can be used for events. The largest room would probably fit 100 for a banquet. There is also the mezzanine level for meetings and this has a small terrace (apparently this can only be used until 2100 because of the apartments opposite). This is where a bar will appear sometime in 2019. There is a fair-sized gym on the lower basement floor, or you can run along the Thameside path. A really impressive hotel. If you’re not bothered about the views, these are large and luxurious rooms, with fantastic soundproofing, technology and great service – I enjoyed talking with several members of staff while there and they could not have been more helpful and engaging. Highly recommended.